Good Morning, I took the liberty of linking you up. Beautiful dahlias, I love the arrangement of the whites, and that lamp isn't too shabby either. That vase full of pink is pretty stunning also. 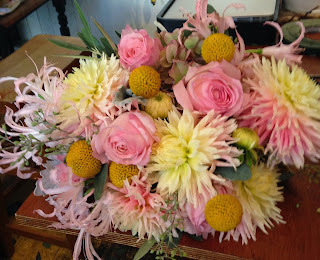 Lucky customers who get some in their bouquets. Now go forth and spread some flower joy. Lovely!! Your bouquet of the week is inspiring, and I really love the white dahlias. I love the shape and color of the peach dahlias. You should plant more next year. Would you let me know what they are called once you figure out? I would love to try to grow them next year. Your bouquet of the week is stunning. What a great selection and design. Your dahlias are crazy pretty. Mind fed many rabbits! and I love the naturalist's arrangement. So much nicer than just throwing together "funeral flowers". I can't imagine having enough flowers in my "garden" to be able to call it a crop. Maybe someday...~sigh~ Your flowers are just so lovely, Shelley! I am sooooooo jealous right now. All I could manage was some "maybe weeds" flowers and you have an abundance of dahlias! Grrrrr. It seems like you got an amazing crop. I was never so lucky with the dahlias. Probably not enough water. Did you have to water them a lot? What a great crop! I love your mantle and all the goodies in, on and around it.